One of the most important and influential Palladian houses in England, Holkham took more than thirty years to build to the designs of William Kent and Matthew Brettingham. The central block is connected to four wings, and the architecture and plan of the house is based on purist Classical and Palladian influences. The interior, partially designed by Kent, is an excellent example of restrained Classical decoration, for example the main entrance hall is based on a Roman basilica. The late 18th century garden terrace which overlooks a pond containing a large fountain of Perseus and Andromeda, and the orangery dates to about 1850. The stables and coach block, the game larder and the estate offices are also included under this number. The Hall is surrounded by one of the most important landscape parks in England, see NHER 1802. Holkham Hall was the seat of Thomas Coke (the first Earl of Leicester) and was started in 1734 and finished in 1764 to the designs of William Kent and built by Matthew Brettingham. The walls are of high quality gault bricks made on the site. The hall is built on the site of a medieval manor. Large and extremely important mansion of 1734 to 1764 of local white brick. Stable block, conservatory of 1850, game larder 1803, well. See notes, cuttings and photographs in file. E. Rose (NLA) 9 November 1990. The Hall was begun by Thomas Coke, later First Earl of Leicester, in 1734 and finished in 1764, and was designed by William Kent and Matthew Brettingham.The Hall was designed to reflect Coke’s experiences and tastes acquired on the Grand Tour. The Hall is built of gault brick of exceptional quality with slate roofs. Central block with 4 wings divided by internal courtyards. Arranged as a Palladian villa on enlarged scale, with references in towered central block to Inigo Jones's Wilton House. North front: rusticated ground floor, pedimented central block with central Venetian window recessed under brick semi-circular arch; 2 pedimented windows. Two flanking bays and tower bays with similar Venetian window. Cornice, entablature recessed off ridge. Towers with external storey and hipped roofs. Stacks recessed off ridge. 19th century plate glass to all windows on north. Garden front (South) with rusticated ground floor. Central hexastyle Corinthian portico, entablature with pediment, with six round-headed windows, two pedimented windows either side and single Venetian window, without superimposed arch, to towers. The glazing bars on this front have been reinstated. At four comers two storey link blocks to four wings containing chapel, kitchen, guest wing and private family wing. Each wing has identical elevations: rusticated ground floor, 2 1/2 storey central block of 3 bays, 2 storey flanking blocks of one bay, each pedimented. Each has 4 prominent eaves stacks to central block and subsidiary stacks to flanking blocks. Interior: the central block arranged as suite of rooms of parade on piano-nobile. Central Stone Hall, an evocation of the Vitruvian so-called Egyptian Hall and of the apsed and aisled antique basilica, with alabaster facings, a rich Ionic Order from the Temple of Fortuna Virilis, Rome; coffered cove and compartmented ceiling. To west the North Dining Room, the Sculpture gallery with Octagon rooms at north and south, and on axis with the Stone Hall the Drawing Room with a deep coffered vault. Further Rooms of Parade to South. The terrace on the garden front dates to the late 18th and 19th centuries. The terrace is constructed of limestone balustrading on rusticated gault brick retaining walls. The terrace has a semi-circular projection to the south around the pond and fountain. The limestone fountain itself was designed in about 1850 by Charles Smith, depicting Perseus and Andromeda and is set in a circular pond with moulded stone wall. The Orangery dates to about 1850, and is built of limestone with a 3 bay pedimented centre, and recessed 3 bay wings. Each bay is framed with Roman Doric pilasters on bases with a trigylph above each capital and entablature broken forward at parapet. Pediment with central oculus, now roofless and windowless. Encaustic tiled paving to interior. Possibly part of South terrace by W. Eien Nesfield, about 1850. To the east of the orangery is the octagonal game larder built in 1803 by Samuel Wyatt. Gault brick with slate roof. Basement with door opening on south face with keyed and moulded door surround. Two storey link to the Orangery with central doorway with semi-circular pediment on pilasters; two sash windows with shouldered surrounds. The interior has a fine cast iron octagonal game rack. The Stable/Coach House block is arranged partly around a courtyard open on north side. Late 18th to early 19th century. Gault brick with limestone dressings, slate roofs, partly hipped. Symmetrical facade to south with advanced central block of 6 bays. Two central bays pedimented. Rusticated quoins, plain stone strings and plinths. Lower 3-bay side wings, still of 2 storeys, slightly recessed from main block. The entrance is flanked by stone gate piers with ball finials, and a stone-capped gault brick boundary wall linking to two 2-storey corner turrets with stone rusticated quoins, pyramidal roofs with gilded ball finials. The estate offices are of early 19th century gault brick, hipped slate roofs with projecting gable wings. Rusticated brick quoins. (S2) considers Holkham to be the 'supreme achievement' of neo-Palladianism in England. See (S1) to (S3) for full details of the architecture and interior of the Hall. Proposal to reuse existing buildings to provide visitor centre toilets. H White (NLA) 21 November 2008. The first stage in a four- year garden restoration project has begun in gardens one kilometer from the hall. H. White, (NLA), 5 October 2009. Article - 29 May 2010, missing from file [J. Yates 30 July 2010]. Article giving a brief history of Holkham Hall life, article also includes floor plan of hall. See (S7) for further information. M. Langham-Lopez (HES), 18 April 2013. --- Aerial Photograph: TF8841 D; TF8842 A-M,P-R,U-WW,AD-ABA. --- Aerial Photograph: Edwards, D.A.. 1996. TF8842/ABY - ACD; TF8843. --- Aerial Photograph: Edwards, D.A.. 1995. TF8842/ABB - ABL; TF8843/C,D. --- Aerial Photograph: Edwards, D.A. (NLA). 1996. TF8842/ABW - ABX. --- Aerial Photograph: Edwards, D.A. (NLA). 1994. TF8842/ABM - ABV. --- Aerial Photograph: Edwards, D.A. (NLA). 1996. TF 8842ACE - ACH. --- Aerial Photograph: Edwards, D.A. (NLA). 1997. TF 8742ABQ - ABV. --- Monograph: Davison, A.. 1988. Six Deserted Villages in Norfolk.. East Anglian Archaeology. Vol 44, p 47. p71. --- Newspaper Article: Eastern Daily Press. 2005. Chronicle of glory.. 17 December. Sunday Supplement pp 1-3. --- Photograph: Edwards, D.A.. 1988. ELL 6-13. --- Photograph: Edwards, D.A.. 1988. ELN 3. --- Newspaper Article: Eastern Daily Press. 1982. Holkham - Portrait. The heritage is business.. 17 April. --- Newspaper Article: Eastern Daily Press. 1987. Bringing paintings back to life.. 31 December. --- Newspaper Article: Eastern Daily Press. 1988. Estate home of noted agricultural pioneer.. 27 April. --- Newspaper Article: Eastern Daily Press. 1989. Treasure house beside the coast.. 2 June. --- Newspaper Article: Eastern Daily Press. 1998. The building of beauty.. 10 January. --- Newspaper Article: Eastern Daily Press. 2002. Holkham Hall - picture.. 19 April. --- Monograph: Wade-Martins, S.. 1980. A Great Estate At Work: The Holkham estate and its inhabitants in the nineteenth century..
--- Website: Holkham Hall. 2005. www.holkham.co.uk. --- Newspaper Article: Eastern Daily Press. 2009. Making sparks fly again. 5 January. --- Newspaper Article: Eastern Daily Press. 2009. Holkham Hall - picture.. 22 December. --- Newspaper Article: Eastern Daily Press. 2010. Object lessons in Norfolk's rich heritage. 29 May. --- Newspaper Article: Eastern Daily Press. 2010. Landmark objects - Coke's monument.. 29 May. --- Leaflet: Holkham Hall: A Short Guide to the State Rooms. --- Article in serial: John Leyland. 1898. Country homes: Holkham.. Country Life. 1 January, p3. --- Article in serial: 1908. Holkham - I.. Country Life. 6 June, p13. --- Article in serial: 1908. Holkham - II. Norfolk.. Country Life. 13 June, p9. --- Article in serial: Campbell Dodgson. 1923. The drawings at Holkham Hall.. Country Life. 21 July, p3. --- Article in serial: 1929. The Great Hall, Holkham.. Country Life. 28 December, p1. --- Article in serial: Major C. S. Jarvis. 1950. A Countryman's notes.. Country Life. 7 July, p1. --- Article in serial: Geoffrey Harmsworth. 1952. The home of the Earl of Leicester.. The Connoisseur. p10. --- Article in serial: Christopher Hussey. 1954. Holkham Hall, Norfolk.. Country Life. p8. --- Article in serial: W. O. Hassall. 1968. The temple at Holkham, Norfolk.. Country Life. 16 May, p3. --- Article in serial: 1969. One of the wings at Holkham Hall.. Country Life. 27 February, p1. --- Article in serial: John Martin Robinson. 1974. Estate buildings at Holkham - I.. Country Life. 21 November, p2. --- Article in serial: Leo Schmidt. 1980. Holkham Hall, Norfolk - 1. Country Life. 24 January, p4. --- Article in serial: Leo Schmidt. 1980. Holkham Hall, Norfolk - II.. Country Life. 31 January, p4. --- Article in serial: John Cornforth and Leo Schmidt. 1980. Holkham Hall, Norfolk - III.. Country Life. 7 February, p4. --- Article in serial: John Fleming. 1961. In search of landscape gardens.. Country Life. 27 July, p1. --- Article in serial: John Cornforth. 1988. Augustan vision restored.. Country Life. 4 August, p3. --- Article in serial: 1992. Country Life. 1 October, p2. --- Documentary source: English Life Publications. 1990. Holkham Hall. --- Unpublished document: Ann Sjoblom and Jennifer Gustafsson. 2001. Study of the Restoration of the Fighouse.. May. --- Newspaper Article: Eastern Daily Press. 2012. Make a bid to own little bit of history from estate. 3 July. <S1> Unpublished document: Heywood, S.. 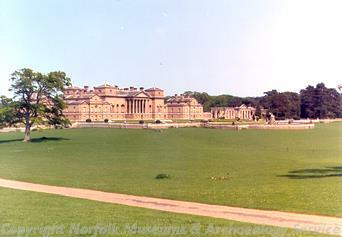 Historic building report for Holkham Hall, Holkham, Norfolk..
<S3> Monograph: Wilson, R. & Mackley, A.. 2000. Creating Paradise: The Building of the English Country House 1660-1880..
<S4> Monograph: Worsley, G.. 1995. Classical Architecture in Britain: The Heroic Age.. p 188. <S5> Unpublished document: Cable, I.. 2008. Design and Access Statement, Proposed Visitor Centre Toilets, Pottery Yard, Holkham Hall. <S6> Newspaper Article: Eastern Daily Press. 2009. Horticultural students help with garden restoration. 1 October. <S7> Newspaper Article: Eastern Daily Press. 2012. The hidden cogs that kept life running like clockwork.. 19 December.